“Cheese does contain some important nutrients, including calcium and protein, along with vitamin B12 and zinc. However, the calories can add up quickly if you aren’t mindful,” said Kelly Pritchett, a registered dietitian and spokeswoman for the Academy of Nutrition and Dietetics. Softer cheeses tend to have fewer calories than hard cheeses: an ounce of whole-milk ricotta (approximately 2 tablespoons) has about 50 calories, an ounce of feta has 75 calories, and an ounce of whole-milk mozzarella has 85 calories. But an ounce of Swiss (one slice) has 108 calories, and an ounce of cheddar has 114 calories (picture about a one-inch cube, depending on the kind). For the same calories, you can have a cup of black bean soup and probably feel just as full. Cheese is also high in saturated fat, which is known to increase LDL cholesterol, the “bad” cholesterol. In fact, cheese is one of the biggest sources of saturated fat in the US diet. Some research (supported by the Danish dairy board) suggests that full-fat cheeses don’t seem to negatively affect LDL cholesterol as would be predicted based on its saturated fat content. “It is not clear exactly why this is the case but may have to do with other nutrients in cheese, like calcium or protein, modifying the way the fat is absorbed or metabolized,” said Gregory D. Miller, chief science officer for the National Dairy Council. Still, when it comes to fat content, some cheeses are lighter than others — and the higher the fat, the higher the calories. Cottage cheese has the least amount of fat, with 1 gram per ounce. Ricotta has 4 grams of fat per ounce, and feta and mozzarella have 6 grams each. Parmesan, Swiss and cheddar are higher in fat, with 7, 8 and 9 grams of fat per ounce, respectively. “Using soft cheeses like mozzarella versus cheddar can be helpful if you are looking for ways to cut calories,” Pritchett said. 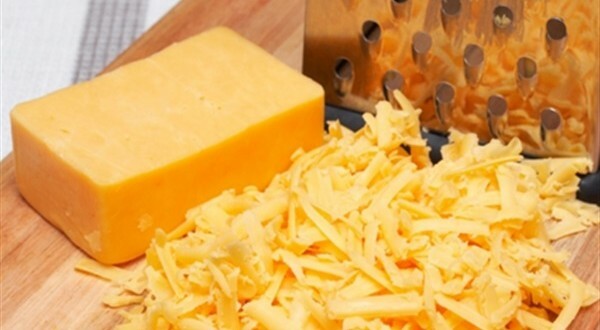 Interestingly, despite its higher calorie content, hard cheese like cheddar can be beneficial for your teeth. Aside from getting calcium and other minerals from it, consuming hard cheese generates saliva, which helps make your mouth less acidic and your teeth less prone to cavities. Pritchett suggests using cheese as a flavor enhancer for meals instead of making it the focus: sprinkle feta or goat cheese on a salad for extra flavor, or add Parmesan to your favorite soup for extra pep. And if you are enjoying cheese with crackers, limit it to 1 ounce. Limiting portions will also keep sodium levels in check, as it can be as high as 260 milligrams for an ounce of feta and 390 milligrams for an ounce of hard Parmesan. So feel free to enjoy cheese, but just be careful not to overdo it. Previous: Here are 5 common dietary beliefs that are… wrong!